Pounding up Beattock a decade after nationalisation is the reincarnation of the London Midland & Scottish Railway. In 1956 the standard livery for main line coaching stock was changed from carmine and cream to maroon. The only exceptions were the Southern Region, which reverted gratefully to green, and the Western where inevitably chocolate and cream re-appeared, if only for named expresses. Two years later, with increasing Regional autonomy, the London Midland Region decided to paint selected examples of its most powerful passenger locomotives - the 'Coronation' and 'Princess Royal' Pacifies - red. A red that was as near as dammit the old LMS colour (although purists insist it was actually closer to the crimson lake of the pre-grouping Midland Railway). For the next six years until the withdrawal of the last of the Pacifies it was possible to glimpse scenes such as this: 'Coronation' Class 4-6-2 No. 46229 Duchess of Hamilton at the head of "The Caledonian" - red from tip to toe in a passable imitation of a pre-war LMS express. "The Caledonian" was a late flowering in steam's Indian summer on the West Coast Route. Introduced in 1957 it averaged a mile-a-minute between Euston and Glasgow in a palpable demonstration of the progress being made in the long haul back to pre-war standards of running. 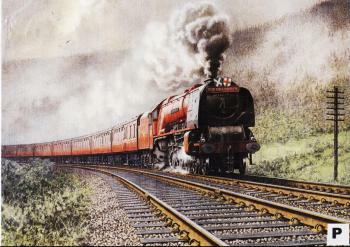 Duchess of Hamilton was one of the first of its class and was originally built as a streamline locomotive in 1937 for working the "Coronation Scot". The 'Coronations' were superb machines whose vast haulage capacity was perhaps never fully exploited. Their speed capability was, however, when No. 6220 Coronation itself on the press run for the "Coronation Scot" temporarily grabbed the British rail speed record with 114 mph, closely followed by a 57mph white knuckle ride over the 20mph-restricted approach to Crewe station. Luxurious new carriages were built for the "Coronation Scot" in 1939 and proudly sent for exhibition to America. As Coronation itself was not available to go with them Duchess of Hamilton swapped name and number with No. 6220 to tour the country in disguise. While still out there war broke out and it was not until 1942 that the Duchess was able to brave the U-boats and return to Britain. Safely back home she reverted to her former identity and ran until 1964 when she was acquired by Sir Billy Butlin for static exhibition at his Minehead holiday camp. Today Duchess of Hamilton is back in working order and recently became a TV star with a solo performance on the BBC's 'Steam Days' series.